In 1920s America it was considered socially unacceptable for women to smoke. The tobacco industry wasn’t happy about this because they were losing out on 50% of the potential market. And so, one day, a man called George Hill – the then president of the American Tobacco Corporation – approached a guy called Edward Bernays and asked him for help ‘to persuade women to smoke’. Edward Bernays was the nephew of Sigmund Freud. He was also the founder of ‘public relations’. He was influenced by his uncle’s psychoanalysis and used it to transform objects into emotional symbols that tapped into unconscious desires and feelings. By organising a cunning publicity stunt which involved attractive young ladies smoking cigarettes as ‘torches of freedom’ he made smoking for women not only socially acceptable, but desirable. Sales of cigarettes rocketed. The point here is that objects are rarely just objects. They are imbued with the significance of symbolism. A headcovering for aesthetic or functional (to keep the head warm) purposes is usually unproblematic but when a headcovering is connected to an idea or is a symbol it has the potential to rouse strong emotions and initiate vigorous debate. Headcoverings are part of many cultures and religions but it’s the Islamic headscarf which has caused most controversy in recent years. Ultra-orthodox Jewish women are expected to cover their hair and generally do so by the wearing of a wig. Up to around the 1960s Irish women used to cover their hair with scarves and there is a ‘headcovering movement’ for Christian groups in the US who cite extracts from Corinthians. None of these attract the same level of attention as the Islamic hijab. The hijab is simply a piece of cloth that covers the hair (as opposed to the niqab which only leaves the eyes visible or the burqa which covers everything). The hijab is banned in France. In Turkey and Tunisia it’s not allowed in public buildings or schools. In Ireland, although there are no legal restrictions, it has been the subject of debate. I’ve spoken to many Muslim women in Ireland, including Irish converts, who have felt discriminated against on the basis of wearing the hijab. I’ve met women who were stared at, called names, told to go home to their own country, who were forced to take off the hijab if they wanted certain jobs and who were even spat at. 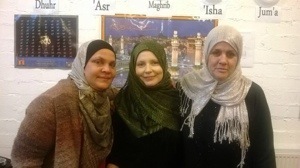 One Irish convert stopped wearing the hijab because of how she was treated in her social circles. 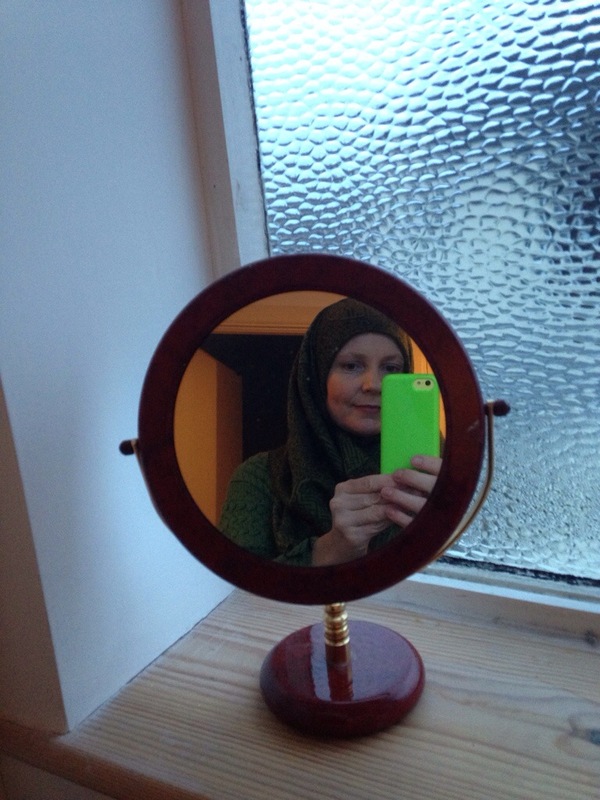 And so, when I got a phonecall last week from Lorraine of the Muslim Sisters of Eire asking me to wear the hijab for World Hijab Day ‘to walk in their shoes for a day’, I was delighted. landed back in the lonesome tiger-suburb of Clongriffin to meet the Muslim Sisters of Eire. The current ‘mosque’ where they meet is in a floor-level retail outlet of the huge but vacant shopping centre. Outside, the pavements are empty, the bicycle parking area is just shiny bars and there’s no-one waiting at any of the bus stops. The room was cold and bare. Around eight colourful prayer mats were facing one of the corners. There were just three other women there when I arrived – all seated on the floor close to the radiator which was just heating up. But the room filled up to about a dozen women and a handful of young children and babies. 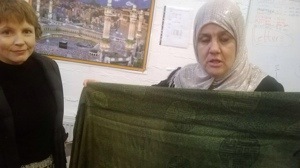 A talk was given by one of the ‘sisters’ about ‘manners in the mosque’. 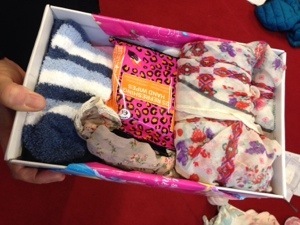 It included instructions not to eat garlic or onion before going to the mosque and to not go with smelly socks either. 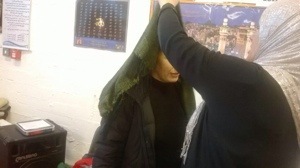 After the lesson Lorraine showed me how to fold my scarf and wrapped it around my head. It was my first time ever wearing a proper hijab. My immediate impression was that it felt surprisingly snug and that my hearing changed. Sounds were slightly numbed by the cloth against my ear. The women told me that I’d get used to that. They smiled when they saw me with the hijab on and told me it looked good on me ‘mashallah’ (which I think is the equivalent of ‘thank God’). 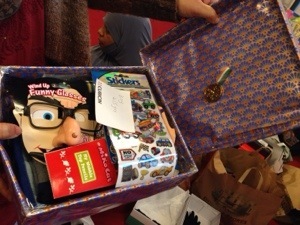 I headed off as the women sat down to wrap dozens of shoe boxes that they had filled with goods for people in Syria. Later, at home, I watched a few videos online about how to wear a hijab. All the hijabs looked beautiful and stylish. My cotton green pashmina seemed plain by comparison. I searched online for where to buy hijabs in Dublin but had no success so I decided to make do. Saturday morning was stormy so my intention to visit the nearby Marlay Park market was scrapped. We were planning on a traditional Irish dinner of bacon and cabbage with a glass of wine for dinner so my husband did the dinner shopping as I reckoned it wouldn’t be appropriate for me to buy pork or alcohol whilst wearing the hijab. It took me a few trial runs to get the hijab on snuggly. Then I set off myself to a supermarket nearby to get a few things and to gauge reaction. I did feel slightly nervous as I drove there. I’d no idea if people would react or not. But no-one even noticed me. Then I headed down to Dundrum Shopping Centre. I didn’t actually need to buy anything and purely went for research purposes. I noticed two or three people looking at me but their looks were curious rather than malevolent. Usually no-one pays me any attention so it was novel to have anyone looking at me. I was hot in the hijab and reckoned I looked more like a pre-Vatican II nun than a Muslim lady. I did have an idea that because I was wearing the hijab that I was meant to be invisible to men or that the hijab conferred upon me an invisible boundary of ‘don’t come near me’. So when a male shop assistant asked me if I needed help with anything I was taken aback and almost recoiled. Later on that night I was in town but again, attracted no attention. Someone told me that the reaction depends a lot on the area. 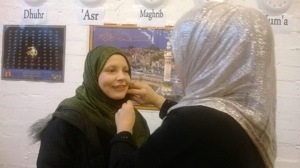 Next year I’ll be braver and venture into other areas but for now that was my experience of World Hijab Day this year. For the day I felt an affinity with Muslim women all over the world and temporarily felt part of the great Muslim sisterhood – more so, even, than when I fasted for Ramadan last summer. I did a search of the Quran to find verses relating to the hijab and did find a few verses about veils and clothing but nothing explicit to say that the hair should be covered but I’m not an expert and as a non-Muslim am not qualified to interpret the verses. The debate about the hijab is essentially a power struggle about control of the meaning of the symbol. The hijab means different things for different people – its symbolism depends on cultural and religious perspective, gender, geographical location and social norms. For some it’s a symbol of faith and piety, for others it’s linked to oppression and patriarchy, and for some it’s about liberation, pride, beauty, sisterhood, a celebration of cultural difference or escape from Americanisation. There is no one way to wear it, no one way to view it and no one way to decide on what the wearing of it means. 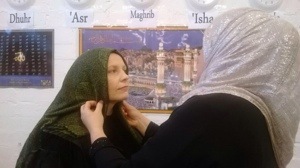 For World Hijab Day 2014, it was my pleasure to ‘walk in the shoes of Muslim women’ in Ireland. And maybe next year I’ll do it again. 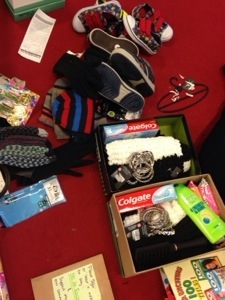 Goods ready to be packed into the shoe boxes. 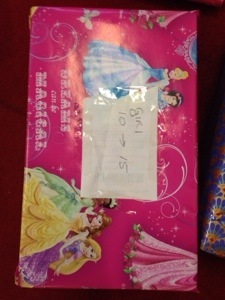 One woman I met had spent over €150 euro with her family on goods to fill boxes.